The Bar picked up the tag titles with help from the Big Show a few months ago. Now, Sheamus and Cesaro must face off against the two SmackDown teams that carried the brand's tag division for the better part of a year. The Usos and The New Day revitalized the tag team division in the WWE with their epic rivalry which ran from 2016-2018. However, The Bar, who dominated Monday nights for the majority of the Brand Split, and looked to continue their reign of terror with a win tonight. Sheamus and Kofi Kingston started the match off. Sheamus sent his opponent down to the mat with a rough shoulder tackle, overpowering Kingston. The New Day member took Sheamus down with a dropkick, however, then tagged in Xavier Woods. Woods and Kingston almost put Sheamus away with some tandem offense, but the pin was broken up. An uppercut from Cesaro prevented a dive by Jey Uso, and Sheamus caught Woods, sending him downward with a backbreaker. The Bar began working over Woods in their corner, nearly getting the pinfall a handful of times. Cesaro and Sheamus continued to beat down Woods with a double clothesline followed by a headlock from Sheamus. Woods was fading fast, and the Bar didn't let up. The Usos tried multiple times to get in, but could not legally without being tagged first. Woods finally fought out, knocking Sheamus almost off of the apron and laying out Cesaro with the Honor Roll. Sheamus came in and knocked the Usos off of the apron, then set Woods up at the top of the turnbuckle, pounding Woods' face in. Woods crotched Sheamus on the ropes, and sent the Celtic Warrior down with a dropkick. Woods made it to Kingston, who came in with a springboard assault on Cesaro, who tagged in as well. The agility of @TrueKofi. The power of @WWECesaro. The quickness of @WWEUsos. A Boom Drop from Kingston nearly set Cesaro up for the Trouble in Paradise. Cesaro avoided and put him in the corner. Jimmy Uso tagged in, finally getting into the match. Kofi chased Jimmy into the corner, where he avoided and Jey tagged in. The Usos took out all four of their opponents with a superkick party of their own, followed by a pop-up Samoan Drop to Kingston. Woods broke it up. Jey Uso was tagged out by Cesaro just as he went for the Superfly Splash. Cesaro nearly got the victory, but Kingston broke out. The Swiss Superman sent him for a ride with the swing, then locked in the Sharpshooter. Woods dropped Cesaro with the springboard DDT, but a knee from Sheamus sent him to the outside. 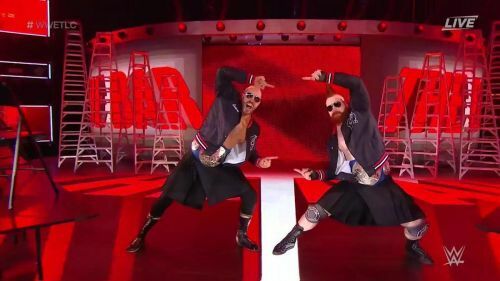 Sheamus tagged in and set up for the Brogue Kick. Kingston avoided, rolling up Sheamus for the two-count. A double stomp from Kingston allowed him to tag in Woods.
.@TrueKofi sets up @XavierWoodsPhD for a huge diving elbow! Trouble in Paradise dropped Sheamus, and the springboard elbow drop from Woods almost put The Bar away, but The Usos and Cesaro broke it up. Kingston took out Cesaro and The Usos on the outside with a dive from the top rope, leaving Woods to fend for himself against the former WWE Champion Sheamus. Cesaro slowed down Woods by tying up his feet, allowing Sheamus to connect with the Brogue Kick as he was going for another springboard maneuver, picking up the win and retaining the titles. Results: The Bar defeated The New Day and The Usos via pinfall. The Bar managed to defeat both The New Day and The Usos at the same time tonight. One has to wonder who is next in line for the SmackDown Live Tag Team Titles now that two of the WWE's top teams will more than likely be moved to the back of the line. The Bar dominated Monday nights for well over a year and will continue to reign on the Blue Brand as we move into the new year.